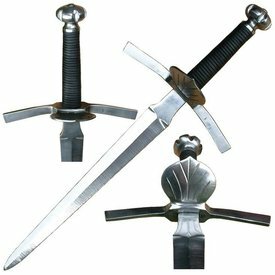 The main-gauche was a parrying dagger that was worn in the left hand (main gauche is French for left hand) and was used combined with a duelling sword like the rapier in the right hand. This main-gauche has a length of 55 cm with a blade of 39 cm and a cross-guard with a width of 12 cm. The cross-guard is bent so it is perfectly suited for blocking the enemy weapon and parrying it to the ground. The dagger is available with a blunt (battle-ready) or sharp edge; with a rounded (battle-ready) or sharp tip and with a grip covered with un-dyed leather, red leather, brown leather, black leather.